Just a little update on what’s been happening lately in my art world. 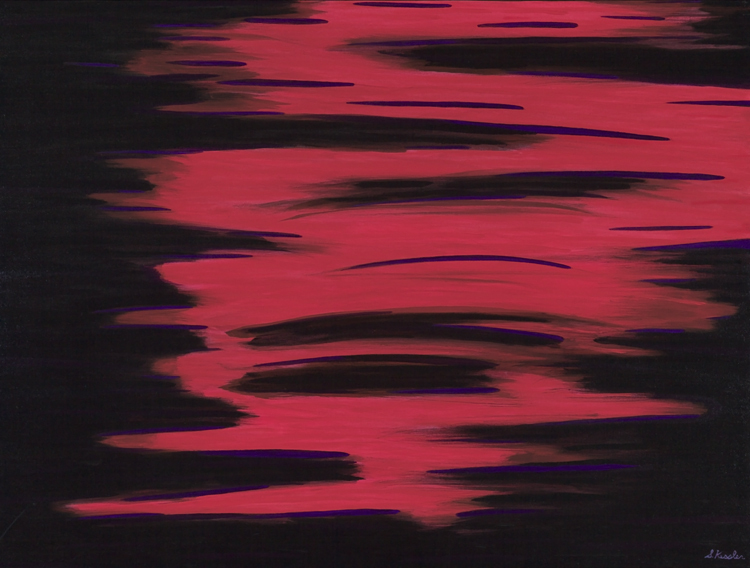 First of all, I wanted to let you know that my painting called “The Earth is Flat” can now be viewed in a virtual art gallery at: https://www.youtube.com/watch?v=Cnk_1S2G-oE&feature=youtube. It’s done by Artists Info in England. I have a page on their website at: www.artistsinfo.co.uk/artist/susan-kessler. And this month, I’m one of the four “Artists of the Month” on their homepage. Also, as of late, I’ve been doing a different style of photo collage. 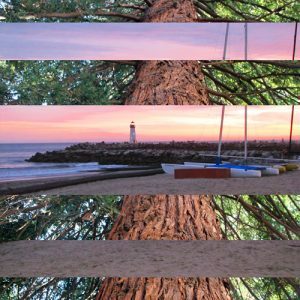 I just like to bring the viewer into a new and unique way to view Santa Cruz. Change can do an artist good sometimes! With these “oval” shaped photo collages, I’ve decided to offer them as 12″x18″/18″x12″ sizes. Therefore, they will be more affordable, and nowadays, who doesn’t like that? Of course, they can be ordered in the 20″x30″/30″x20″ sizes also. 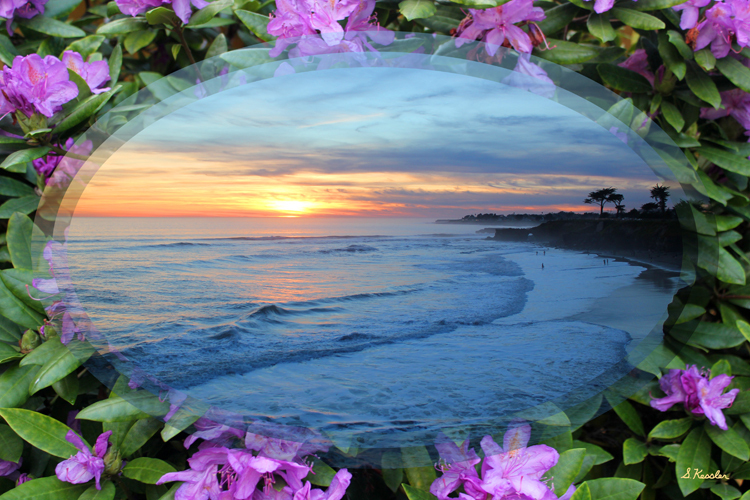 The photo collage below is called “Blue Ocean Sunset in Purple Flowers”. 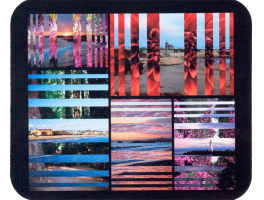 I hope you’ll check out my “Photo Collages” page to see more of my most recent works. And have an awesome spring into summer! This was the way our “Cement Ship” looked, before the recent storms. It’s real name is the “S.S. Palo Alto”. 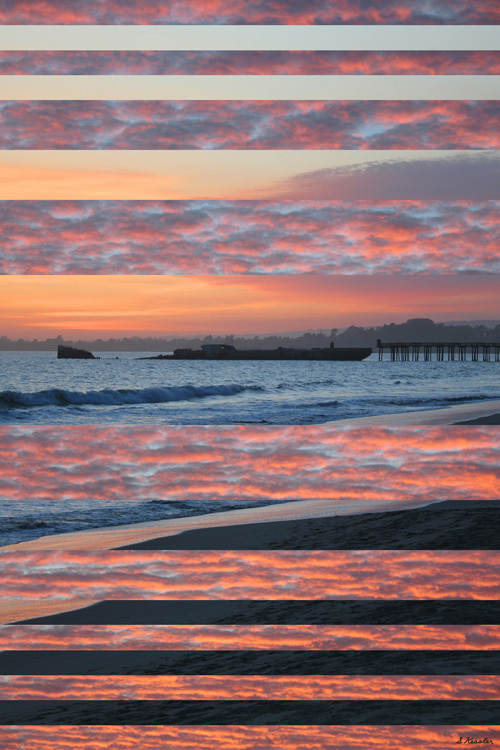 My digital photo collage called “Cement Ship Sunsets” offers a unique and different way to look into the past and remember this beautiful landmark in Santa Cruz County. The ship is still there, but broken into pieces, so it will never look like this again. I’m so glad I was able to photograph it at different times, beforehand. 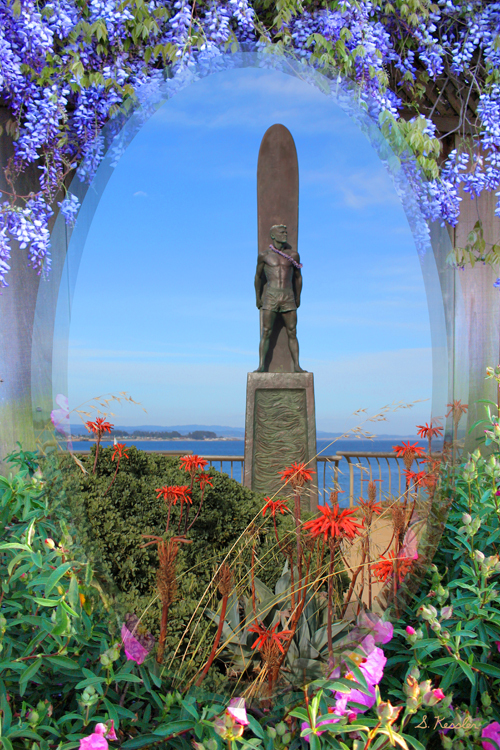 Soon our stormy season will be over and Santa Cruz will have beautiful spring weather and lots of pretty flowers. Have a great and fun springtime everyone! There’s a new show called “Views of the Cruz” depicting places of local artist’s, that fuel their creativity in our area, at the Santa Cruz Art League, 526 Broadway, Santa Cruz, CA 1/6-2/5/17. And there will be a MEMBER’S RECEPTION (A-L) on Sat. 1/14/17 from 3-5pm. 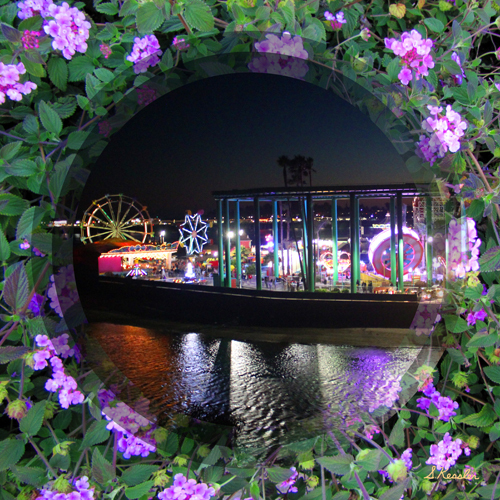 My 30”x20” photo collage (a high gloss metal print) entitled “Colorful Evening Boardwalk” will be part of the exhibition. It’s so interesting to see all the different types of art and the way the artists express themselves through their work. I’m thrilled to be a part of this show! I hope you can stop by and check it out. Happy New Year Everyone! Just in time for the holidays, there’s a new art exhibit at the Santa Cruz Art League called “Small Works in a Great Space”! All the artwork in the show has to be 12″ or less and under $200. which makes it an affordable gift option for art lovers. 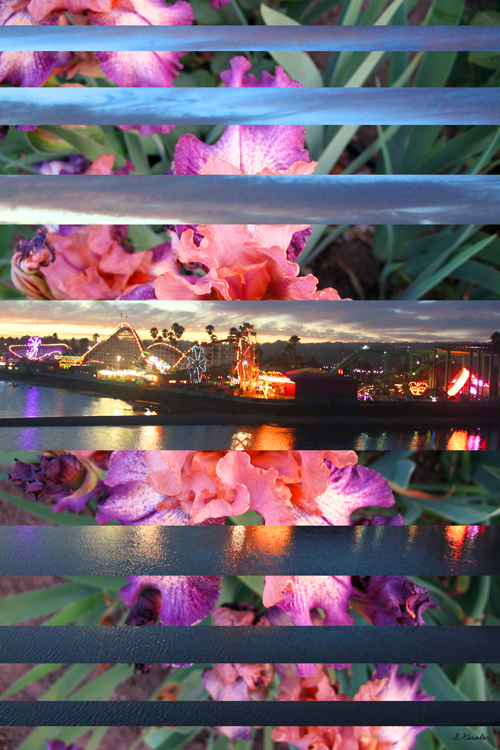 I have two 12″ x 12″ photo collage metal prints (with a high gloss finish) in the show. One is called “Purple Flowered Lit Boardwalk” and the other is “Yellow Flowered Sunset Lighthouse”. They are priced at only $125 each. The show runs from Dec. 9 – Dec. 30, 2106 and there is a reception on Saturday, Dec. 10, from 3-5pm. If you’re in the area, I hope you’ll stop by and check it out. 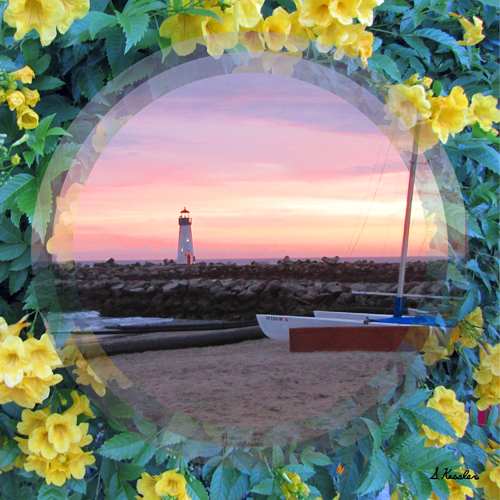 To see bigger versions (12″ x 18″) of these pictures on my website, look under Photo Collages for “Picturesque Lit Boardwalk” and “Floral Sunset Lighthouse”. Also, I want to wish everyone a Happy Holiday Season! 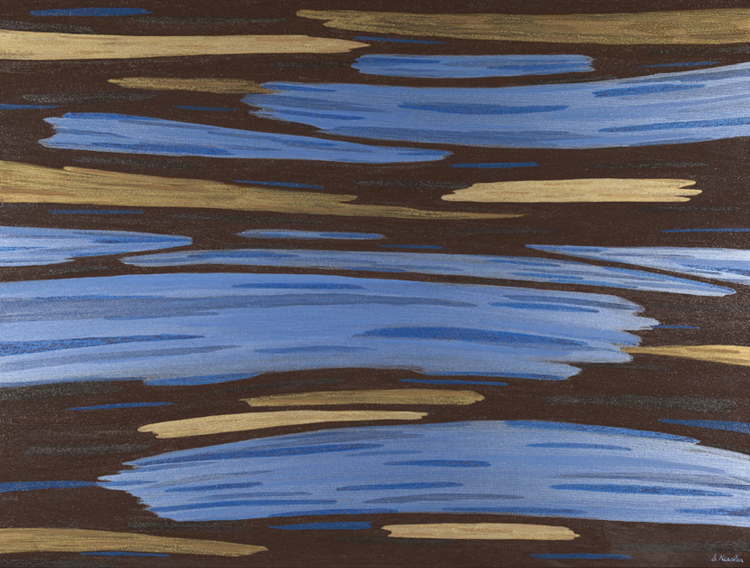 At the Santa Cruz Art League from October 22 – November 13, 2016, there is an exhibit called “Energy & Stillness: A National Abstract Exhibit”, which is a juried art show, and I’m excited and honored that my acrylic painting “Decent Into Madness (with purple hope)” was accepted to be in such a prestigious show. The show really captures the creative “out of the box” imaginations of the artists chosen to have their work displayed in this exhibit. If you’re in Santa Cruz, you should stop by and check it out! Their address is: 526 Broadway, Santa Cruz, CA 95060. I hope your enjoying these beautiful autumn days! 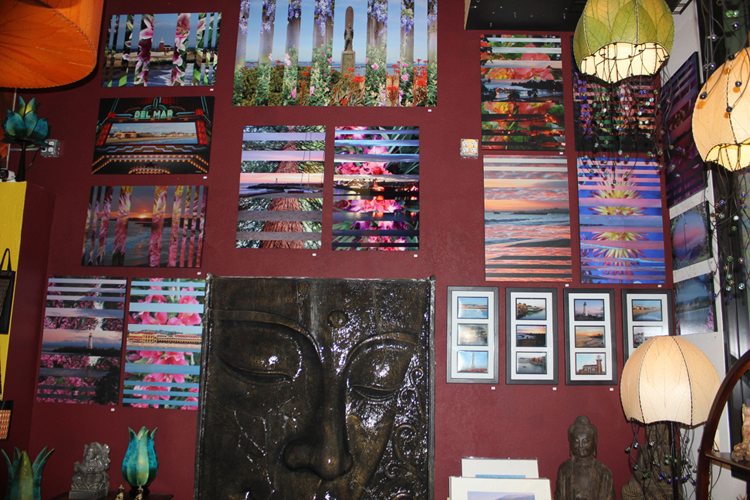 I’m very honored by the wonderful owners of Nut Kreations at 104 Lincoln St., Santa Cruz, CA, who have graciously allowed me to exhibit my paintings, metal prints and photo collages in their store during the month of October 2016. And I have to say, their nuts are yummy! They’ve let me use all of their walls to really have a significant exhibit space. I’m very grateful for this opportunity, and I hope (if you’re in Santa Cruz) you’ll check it out! I am very excited and honored to have my photography work on display at the beautiful Om Gallery, 1201 Pacific Ave, Santa Cruz, CA 95060! The exhibit runs from 8/5/16 to 9/8/16. If you happen to be in Santa Cruz, I hope you’ll check it out! 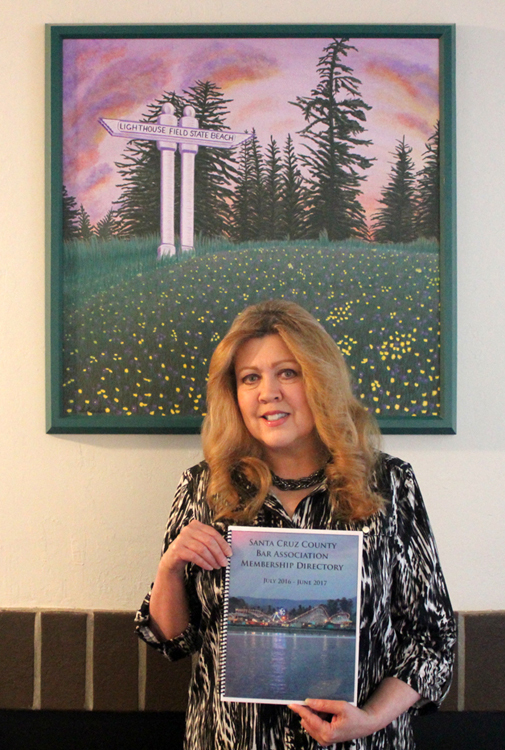 The Santa Cruz County Bar Association is extremely grateful to photographer Susan Kessler for allowing us to use her stunning photos for the covers of our annual membership directories. Susan’s iconic images of local sights, including an ocean view of the Boardwalk, the colorful cottages of Capitola Village, the surfer statue on West Cliff Drive, and other gorgeous shots of our coastline, have made our publications stand out year after year. The weather is getting warmer and Santa Cruz is a great place to be at this time of the year! Of course, for me, anytime of the year in Santa Cruz is good. 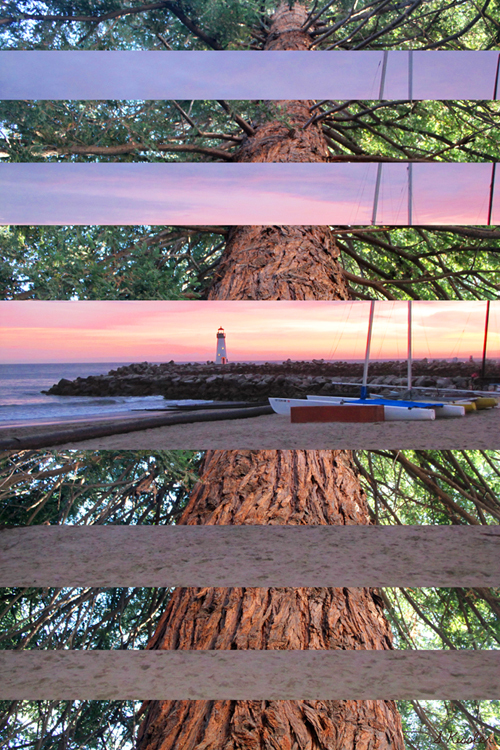 Lately, I’ve been working on some new photo collages, among other things. Also, for the third year in a row, one of my photographs will be used again on the cover of the Santa Cruz County Bar Association’s Membership Directory July 2016 – June 2017, more on that later. Anyway, here’s one of my newest creations. I hope all of you have some great, upcoming summer experiences! Please click on picture to see the whole image.